So you’ve watched the videos, seen the photos and read the event information but still not sure whether to take the plunge and book your place on the arena?! With versions held annually in the UK and Portugal, Tribal Clash is already one of the most popular events in the European competition calendar. This is a fun yet competitive event which is run by an experienced team from the UK – there really is nothing else quite like it in Australia so don’t miss out! Whether you’re travelling just a few miles to Wollongong or flying across the country, this is a fantastic opportunity to spend a weekend on the beach with your teammates and other members of your gym. In between workouts there is plenty of time to chill out, watch other heats and plan your strategy for the next workout – all great opportunities for team bonding! Tribal Clash is more than just a competition – we’ll be bringing a fitness festival vibe to Wollongong with a DJ playing in the heart of the arena throughout the day, blasting out tunes that will always remind you of your amazing weekend competing on the beach! Performing well as a team is key at Tribal Clash, as many of the workouts require all six of you to work in perfect harmony and communicate clearly. Being strong and fit certainly helps, but working together and listening to your teammates is even more important – after all, together we are stronger! So you are good at going to the gym. You may have tested that in competitions using familiar equipment like plyo boxes, pull up rigs and med balls. 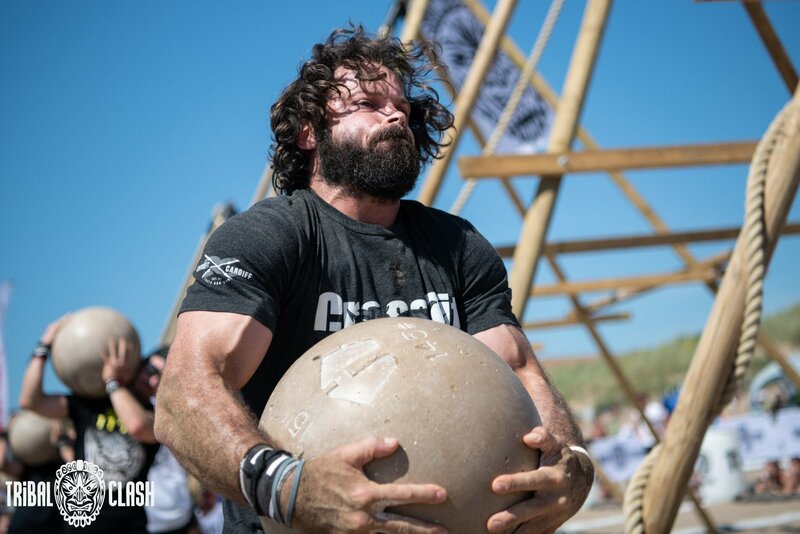 See how you fare using equipment that you probably haven’t worked with before: there are no barbells, rowing machines or ski ergs at Tribal Clash, instead you’ll spend the weekend playing with atlas stones, worms filled with sand, logs and tyres. Workouts might feature burpees, squats, thrusters and ground to overhead movements, but not as you know them! There’s no better feeling than mastering something you thought was impossible, whether it’s lifting a heavy atlas stone, your first open water swim, getting up and over a bar unassisted or completing a 6 man paddle board race without falling in! You don’t need to be an Rx athlete to take part in Tribal Clash, in fact previous competitors have included everyone from beginners to CrossFit Games athletes. Varied workouts play to different strengths so whatever your age, ability, background and experience, as long as you are willing to work hard for your team then this competition is for you! Our professional event photographer captures all the action, so you can spend the weeks after the competition combing through all the photos on Facebook and remembering some of your favourite moments! Tribal Clash is a sociable event which creates a real sense of community, bonded by sand and sweat. Cheer on other teams, mingle with other competitors from across Australia and beyond, and make new friends! How many fitness events are held in such a beautiful location and really take advantage of the natural surroundings, allowing you to spend the weekend competing on the sand with a bit of swimming and paddle boarding thrown in?! Just over one hour’s drive south of Sydney on the Grand Pacific Drive, Wollongong is a vibrant yet laid-back city nestled between the mountains and sea…Find out more about the city’s attractions including stunning beaches and fantastic dining options, all within easy reach of the Tribal Clash arena – http://www.visitwollongong.com.au/. TEAM REGISTRATION FOR TRIBAL CLASH AUSTRALIA CLOSES ON 30TH NOVEMBER. Don’t miss out! Book your spot on the arena and start training for the ultimate test of team fitness.